As we prepare to say farewell to Fr. Tim, we look forward to welcoming our new Associate Pastor, Fr. Mario Amore. Fr. Mario is coming to us from Our Lady of Sorrows in Farmington. He will begin at St. Hugo's on Saturday, June 30th, 2018. 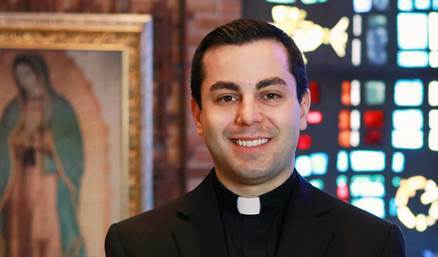 After being ordained a priest for the Archdiocese of Detroit on May 23, 2015, he went on to serve as one of the Associate Pastors at Our Lady of Sorrows where he is currently stationed. Fr. Mario grew up in Woodhaven and attended St. Pius X Catholic School in Southgate and Gabriel Richard Catholic High School in Riverview. After high school, he worked in music ministry at Catholic churches in the Detroit area while pursuing a degree in pastoral ministry as well a bachelor’s degree in Philosophy. Entering the seminary at the age of 22, for six years he discerned and studied for the Catholic priesthood earning a Master of Divinity (M.Div.) and a Baccalaureate in Sacred Theology (S.T.B.). We welcome him with open arms and open hearts.